Here's Hailey at her finest. Listen closely to see if you can detect what she does while working on her iPad. She's a lot like Peyton AND a lot like Austen! Stinker. Clown. Smarty Pants! All these words describe our precocious 4 year old. Today marks two years since we lost Adler. I can't believe it's been that long. That long since I've seen her in her usual spots behind the sofa (we have a console table there now) or on the landing of our stairs (Sadie sometimes lays there and it makes me smile when she does) or in my workout room laying at the base of my treadmill waiting for me to finish. We honor her memory daily through her tribute Sadie. For there is no better way to honor and remember her than by bringing another Bernese Mountain Dog home. Honor because she was such an awesome dog we couldn't bring ourselves not to get another. And, remember because even though their personalities are different there are so many similarities between the two due to their being the same breed. The pain of losing her has been replaced with smiles and fond memories. We visit her and think of her often in our thoughts and words as well as through our home videos of when the kids were younger. She'll always be there...captured in time at different ages. 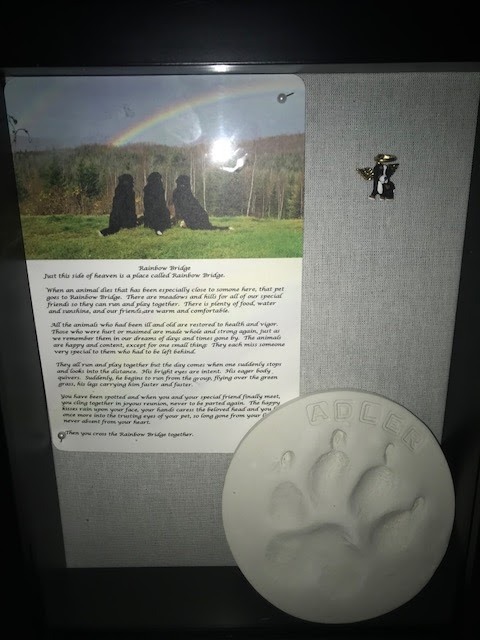 And, we'll always remember our sweet girl Addie who may be gone now from this world for two years but never gone from our hearts. Goodnight my sweet Addie girl. The past week was filled with lots of birthday celebrations for Hailey. It started last Sunday with her Mickey Mouse themed family party. We ordered a Mickey bounce house for about 6 kids - her and her siblings and cousins. She had a lot of fun bouncing for hours before and during the party. Tom painted Mickey Mouse pumpkins which fit the theme too since she's an October baby. She continued to celebrate on her actual birthday with an event at school where she got to walk around "the sun" four times to signal she was four years old now and show pictures of herself from every year of her life. She then passed out a snack she picked of yogurt smoothies (no cupcakes allowed anymore!) and her class sang happy birthday to her. Afterwards, I read two of Hailey's books of choice to the class. Next, we had soccer so after stopping at Starbucks for a cookie and eating a quick lunch at home we hurried off to practice where her coach and good buddy Conor made her feel special. When soccer was over we celebrated with an ice cream and Hailey opened up a very cute present from Conor. And, still there was more. We took Hailey to dinner at Fuller House in Hinsdale. She wanted to go there because she wanted to order the giant pretzel and she did. She topped off the evening with a happy birthday song from us and ice cream with a candle. I'd say it was a pretty good 4th birthday! The best Mickey cake ever! I never went to a Blessing of the Pets ceremony at church before so when Austen and Peyton's religious education program marked it as one way to meet their religious obligations, I put it on the calendar. Besides Sadie could use all the blessings she can get after 2 surgeries all before 18 months of age.. So after hemming and hawing, the kids and I climbed back in the car after school last week to go to church. I heard a lot of, "How long is this going to take? ", "why do we have to go? ", and "I'm staying home!" But once we arrived in the church courtyard and Peyton saw the bunny that came and Hailey saw all the other animals, they were glad they showed up. Plus, the whole ceremony was only 10 minutes and Austen got brownie points from his old religious ed teacher who was there. Double bonus! Sadie was excited to see everyone and tried to eat the holy water as she was blessed. I'm glad I took her though as God was definitely watching out for her today when she broke out of her harness and tried to shimmy up a tree after a squirrel! For the third year in a row, Austen and Peyton's school held their annual Dash n' Bash fundraiser where the kids compete by classroom to see who can raise the most money for the school. Ironically, this year Peyton's class won second place and Austen's class received third. At the end of the fundraiser, the kids compete by class in annual 1K race followed by a back to school party complete with face painting, bounce houses, balloon animals, food and drink. It was hot this year - 90 degrees for the runners in late September. Austen won his classroom heat beating one of his buddies at the finish line. Peyton ran most of it this year but said she had to walk a little because it was so hot. Still she finished strong. And, Hailey had a blast bouncing around in the inflatables (even in the heat), and getting her face painted and having the balloon artist make her a dinosaur. Austen's only regret about the Dash n' Bash was that he had to leave early for soccer practice for the 3rd year in a row. Hey, that's the price you pay for travel soccer! Nonetheless, it was Austen and Peyton's last Dash n' Bash together. After this year, they won't be in school again until Austen's a senior in high school and Peyton's a freshman!